I have been so excited about writing and sharing this post, it's not even funny. Ever since I signed up for the Etsy Swap, I've been on the seat of my chair waiting to find out who I was paired with and what I would shop for and receive. And now, the reveal day. And no, it's not nearly as exciting or as suspenseful as Reaping Day or something. Hashtag: Hunger Games. 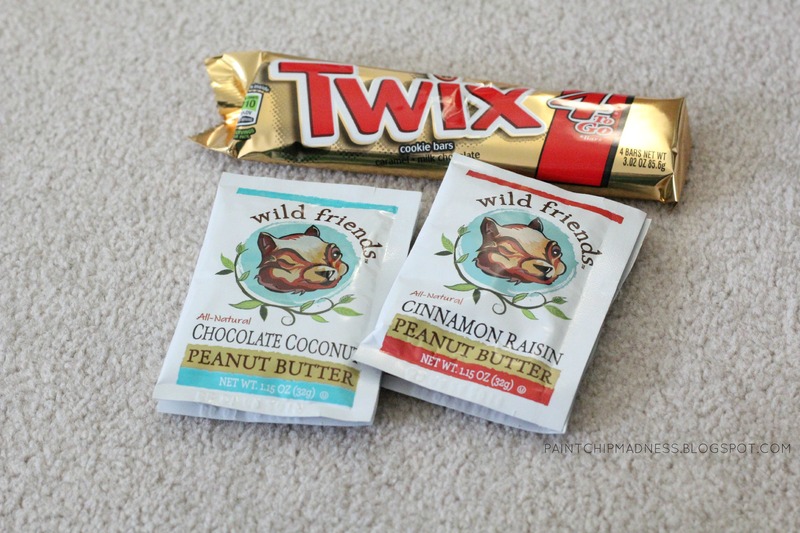 I read on of Lacey's posts that she enjoys eating peanut butter by the spoonful, so I got her a cute hand-stamped vintage spoon and some cute peanut butter packets and a Twix bar, too. I also sent her a pair of pretty earrings that were similar to ones she had favorited on Etsy. Even though I'm allergic to peanut butter and my ears aren't pierced, I loved both of these Etsy products and hope she does, too! 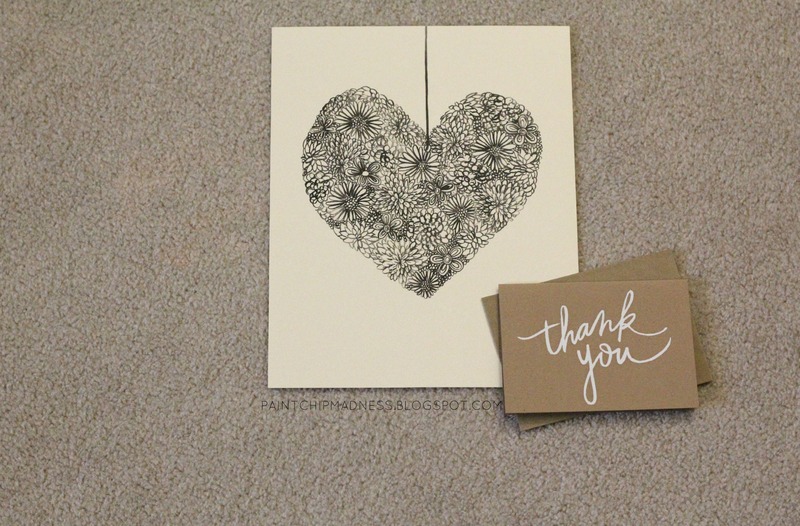 The heart print and Thank You notecard are from one of my favorite Etsy shops, Grounded on the Daily. I have actually had my eye on that print ever since I discovered Etsy and was shocked to get it in the mail. And I was also spoiled with a sweet blank Thank You card (made with kraft paper, my favorite! ), a pretty necklace from another Etsy fave of mine, Ringostone that actually got to my doorstep yesterday. The post office lost it temporarily but I'm grateful it got here right in the nick of time. I'm currently wearing it and am not planning on taking it off in the near future. 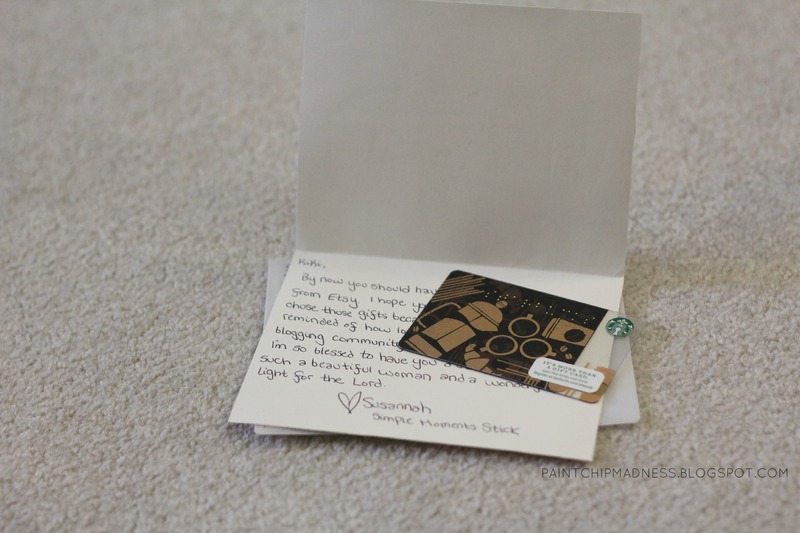 Oh, and I can't forget the sweet letter and Starbucks card from Susannah, too! Yep, she nailed it and a special thank you to her for all of the lovely gifts! And another special thank you to Megan and Amy for creating and organizing this swap! It was a lot of fun and I love that it's not only a chance to get fun snail mail, but to meet other bloggers, too. So did you participate in the Etsy Swap? What did you get? That was such a cool gift you sent! I love the spoon!! I need to get that for The Hubs! Same! I loooved that cute spoon and wanted to send something she wanted (the earrings) and something that was a complete surprise, too. :) That shop (and others like it) have lots of different spoons and they really do make great gifts! oh my goodness i LOVE what you sent (so thoughtful!) and had no idea you were allergic to peanut butter!!! wowza! and my goodness susannah did a fabulous job! the print, the necklace, the cards, the startbucks ;) yayyyyy!! so glad you participated in this swap kiki! I loooved this swap and am so glad I participated, too! I was so relieved to see that Lacey enjoyed the gifts and was so excited to discover that Susannah and I were paired up, too. She really did a great job! Thanks again for doing all this work! I reallllllly loved it and cannot wait for the next one (so yes, please do it again!). I LOVE what you sent to Lacey! You hit the nail on the head, my friend! Oh, and Susannah! Wow. I love that print and the sweet necklace. And Starbucks!? Wowsa. So lucky! It was truly a lot of fun to shop for her (and stalk all her Etsy favorites and social media). I felt like I was planning some surprise party all while getting to know her better, too. :) And I'm most definitely lucky--Susannah did a terrific job! This is so so fun! I love that spoon! And that heart print is the best! such cool gifts that you sent! I had no idea that were allergic to peanut butter. And the starbucks card! LOVE! I loooved shopping for Lacey and while I am allergic to peanuts/peanut butter, I loved all the gifts I sent her way. It really was a lot of fun to not only receive my package but send mine, too. :) And you participated, right? I cannot wait to see what you got/gave! Thank you once again! I am so in love with all the goodies you sent my way and am still wearing my necklace and have framed my print and am just waiting for this weekend to hang everything up. :) Thanks again!!! You're the best, my friend! I love how thoughtful everyone was with their gift picking... I LOVE the gift you sent. Chocolate coconut peanut butter?! Girl...where did you find those little samples? I always want to try all the delicious flavors but don't want to spend the money on a big container unless I know I love it. Too cute! 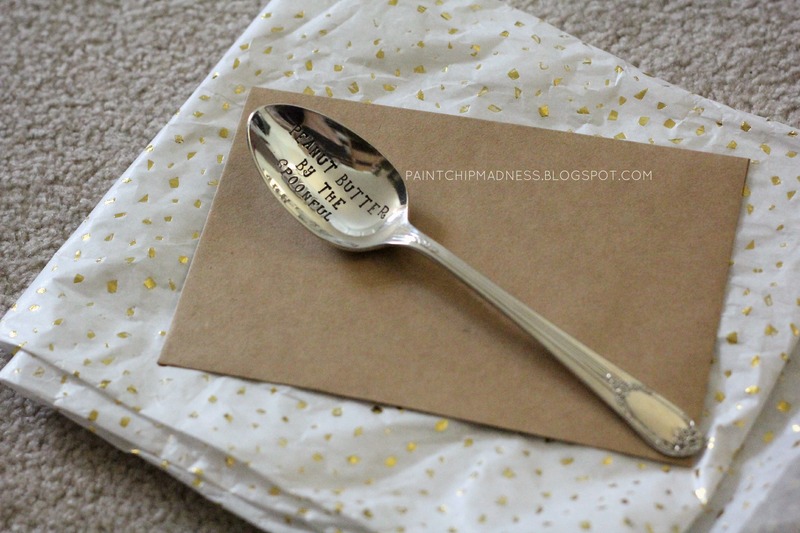 That peanut butter spoon was a great touch, so thoughtful! I love this little Etsy swap, it's so fun bouncing around and seeing what everyone came up with! i feel completely spoiled with all of my goodies! thank you for the millionth time. :-) i am taking my peanut butter packets with me to charleston this weekend so i can eat them before my race for some extra energy. 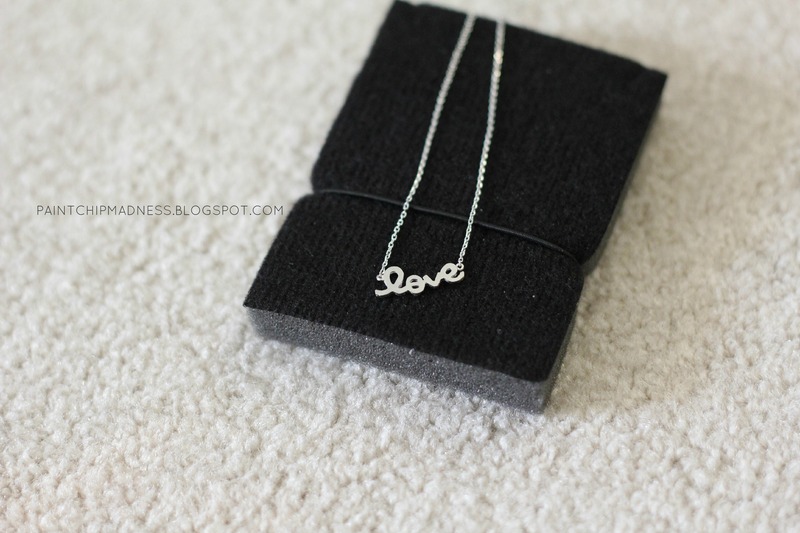 love that delicate little love necklace! that will go with everything! And yes, that necklace really does go with everything! I put it on as soon as I got it and haven't taken it off since! So fun to see who we are paired up with! Love the heart print, it's beautiful. And yes, I love that print, too! It was such a surprise to get a print from one of my very favorite Etsy shops! That spoon is so adorable! I looove the Thank You note and the print-- checking out that shop now:) And the spoon is so so cute! beautiful things! so so SO glad you participated in this with us, friend! So so SO glad I participated! I loved my gifts, the Etsy shopping, and the meeting and making of new friends, too. And I'm also so grateful for your hard work coordinating it all, too!